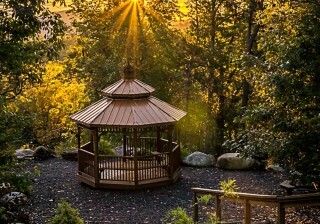 When you are looking for a home in the Blue Ridge Mountains, you may be looking for peace and tranquility. Yet there’s something to be said for choosing a home within a larger community. At Grandview Peaks, we believe you can have both a beautiful view and quiet property and a home within a comfortable community. Here are some reasons why community living is highly beneficial. Neighbors can be a blessing when you have an emergency or simply want to chat over coffee. When you join a mountain community like Grandview Peaks, you will be immersed in a community that has similarly-minded people. These are the people who love nature and a quieter pace of life, and they make great neighbors. Communities like Grandview Peaks have community amenities available to their owners. Whether you spend your days fishing in the 10-acre stocked community lake, enjoy catching some sun on the beach, spend time with family at the stone pavilion or take a picnic to the waterfall picnic area, the community has something to meet your needs. You’ll even enjoy the groomed trails for your morning jog or family hike. Living within a community means you can enjoy regularly scheduled events that help you get to know your neighbors a little better. Community picnics around regular holidays, for example, allow you the chance to interact with other Grandview Peaks residents so you can build friendships and spark new acquaintances. When you don’t live within a community, you are on your own to get to know your neighbors. Another benefit of community living is the quality of the homes. Communities like Grandview Peaks are choosy in the builders they work with, and this means the home you purchase will have the best amenities and design features. These builders know how to capitalize on the views that our property is known for, so you can fully enjoy the benefits of living in a mountain view home. As you can see, community living has many perks. From your neighbors to your community’s amenities and even your home itself, you will find that community living is the final piece in the puzzle to making your mountain lifestyle truly enjoyable. Talk to the team at Grandview Peaks to learn more about our community or to schedule a tour of our available homes.